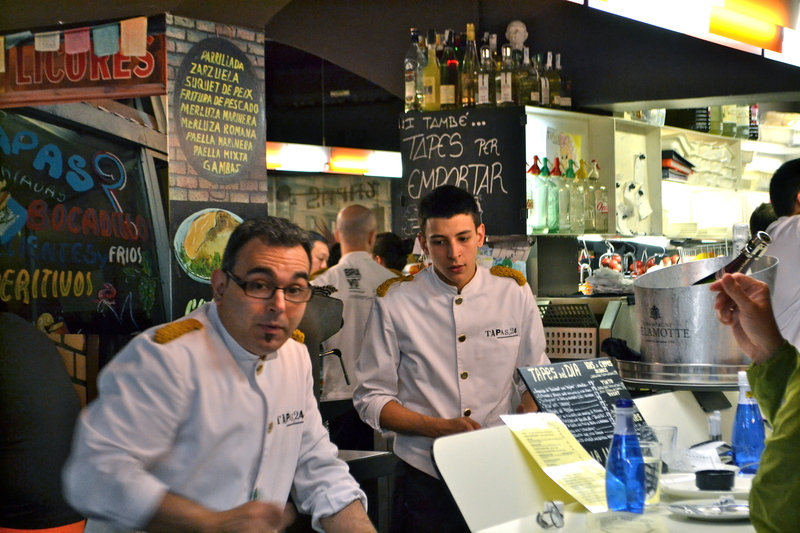 Tapas 24 is all a good tapas bar should be – bustling, efficient, good food and of course great cava. 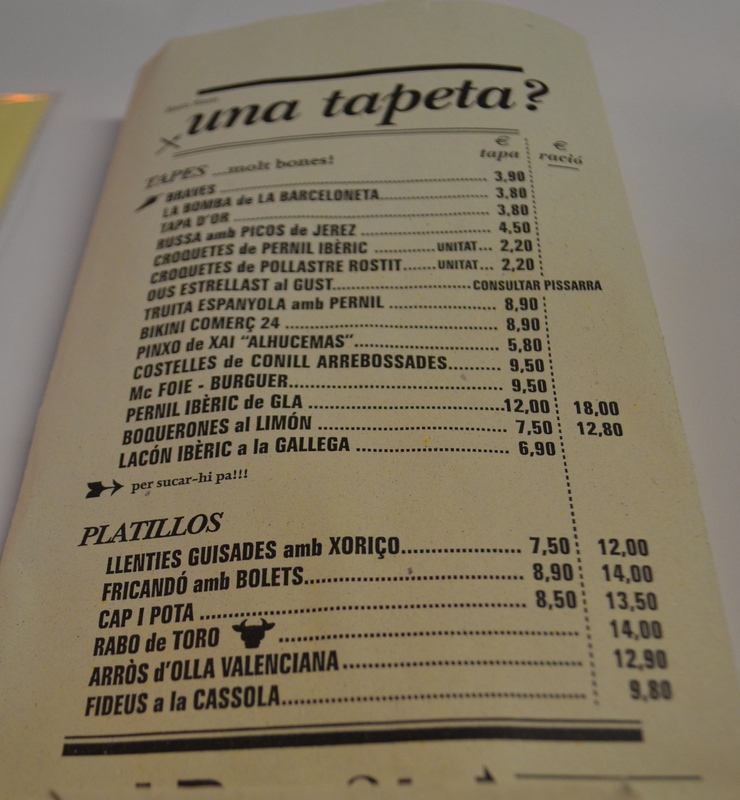 The restaurant is the more affordable sister restaurant of Carles Abellan’s michelin starred Commerc 24. 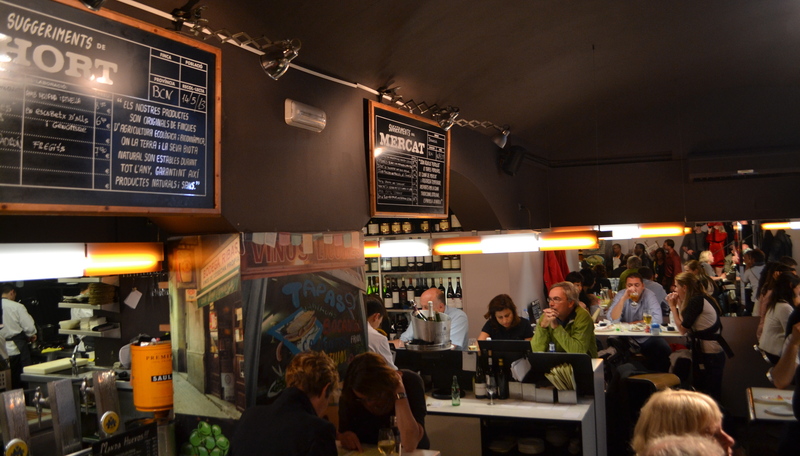 There’s no surprise that Tapas 24 is rumoured to be one of the best tapas bars in Barcelona. Unfortunately, tourists have heard on the grapevine how good this basement bar is so expect it to be busy.. Although it’s best to get there early, the queue moves surprisingly fast. The venue has a great energy about it – diners chatter noisily over their tapas, waiters and chefs hurriedly rush around the kitchen which operates as efficiently as a well oiled engine. If you are lucky, try to nab a bar stool on the counter to be in the heart of the action and breathe in all the wonderful aromas wafting out of the open plan kitchen. If you need any help with the menu, just ask the friendly waiters or if you’re lucky you can get an English menu. 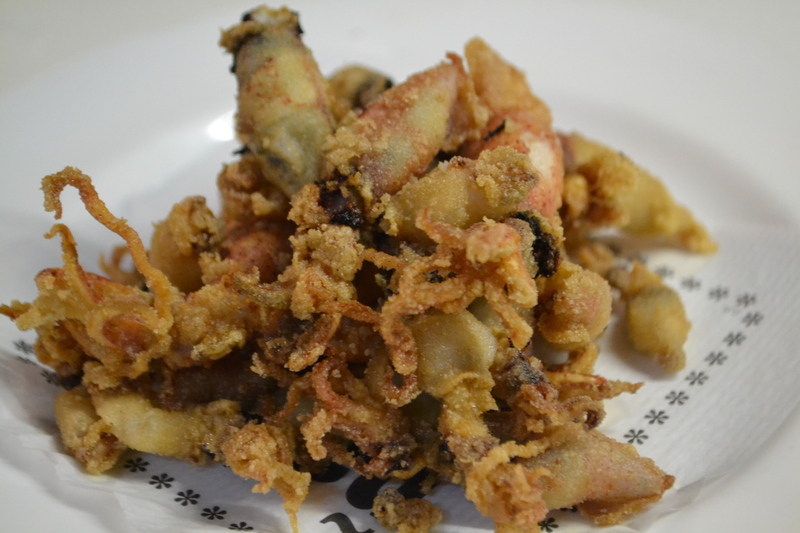 The grilled squid (€9.50) were succulent and perfectly cooked with a crisp outer shell which was simply seasoned with salt and pepper. 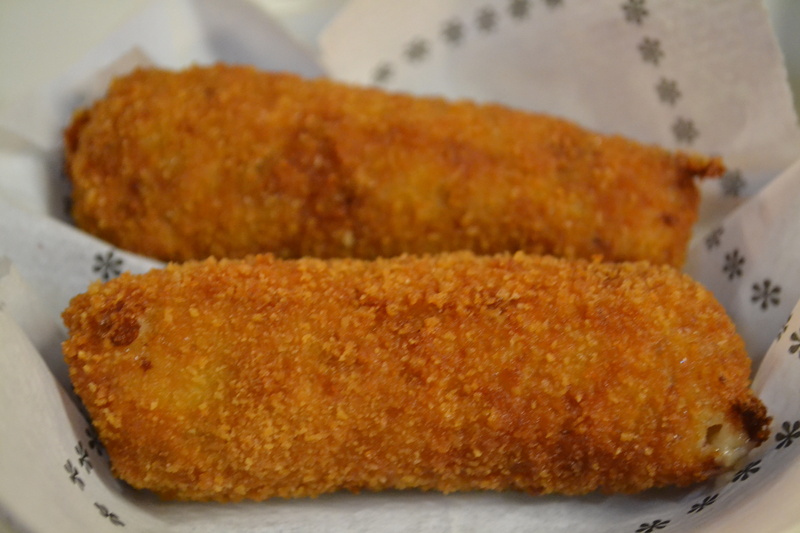 The croquettes de pollastre rostit – croquettes with chicken (€2.20) were moreish with a crisp golden crumb and a creamy chicken filling in the centre. I could have easily demolished dozens of these in one sitting. 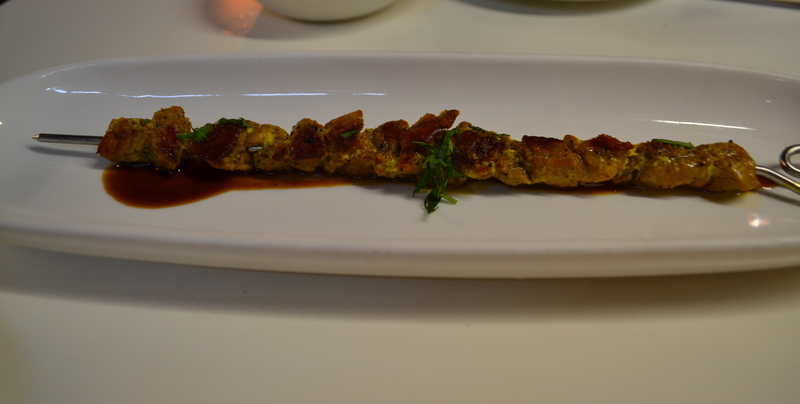 The pinxo de Xai – “Alhucemas” – spicy lamb skewer (€5.50), cooked medium ,was succulent and tender encrusted with a spicy sauce and a sprinkling of parsley. For me this was the winning dish of the night. I could have a never ending love affair with these little beauties. The bombes de la Barceloneta (€3.80) topped with aoili and bravas, were filled with a creamy potato mash and minced beef. 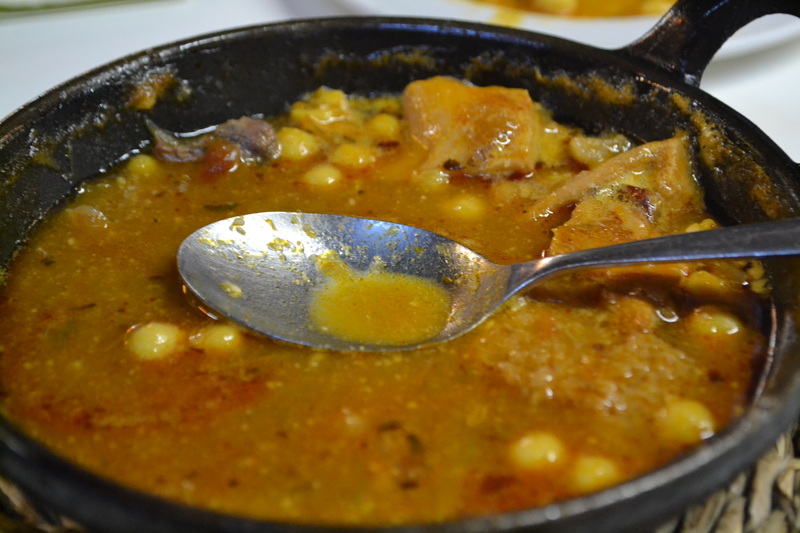 Unfortunately, my taste buds didn’t quite agree with the Catalan traditional dish – Cap I Pota (€8.50) – a tripe based stew served with chickpea and chorizo. I found the mixing of flavours and textures wrong and very confusing but then again I am not the biggest tripe fan. 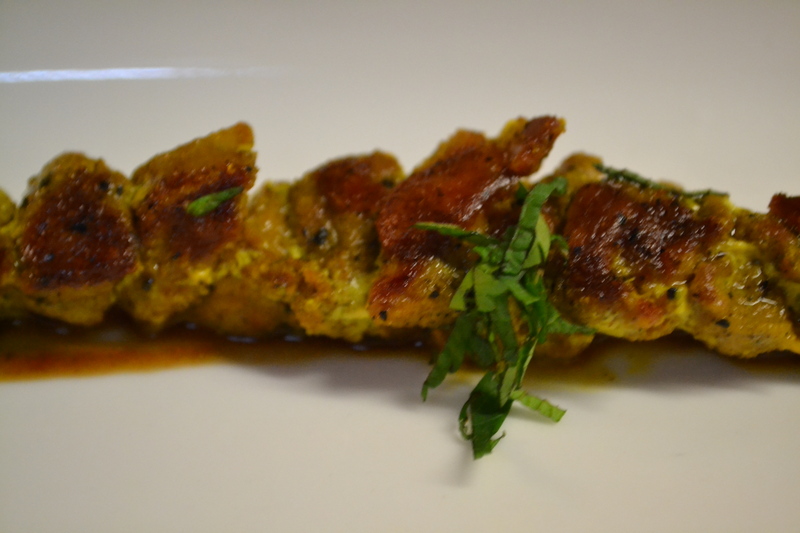 The chorizo overpowered the subtle flavours of the dish, particularly the chickpeas. As for the desserts, I expected slightly more from the chocolate and cookies (€4.50), however they weren’t falsely advertised – described on the menu as exactly that “chocolate and cookies.” The dark chocolate and almond biscotti were a welcome accompaniment however for my full bodied Catalan red. The xocolata (5€) described as “chocolate served with bread” was slightly more decadent.The silky chocolate mousse was rich and smooth, with the rock salt on the top and drizzling of olive oil adding that extra punch of flavour. Overall a great dining experience, highly recommended for tapas lovers who like their food traditional with a playful twist. Great foodporn! I am really hungry after looking at the pictures. 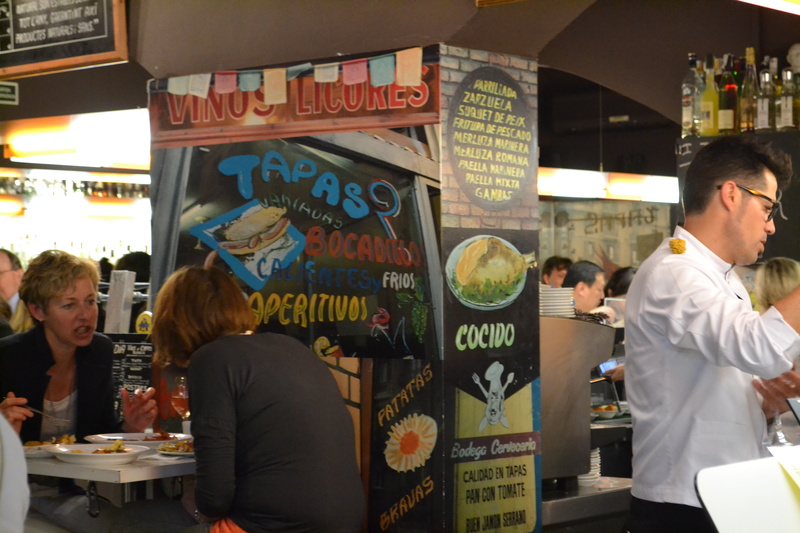 Did you get a chance to try cerveceria catalana? Can be a bit touristy and the wait staff is a bit gruff, but I thought the tapas were excellent, especially the montadito de solomillo.